For the first time in human spacefaring history, a robotic probe has been placed on the surface of a comet. 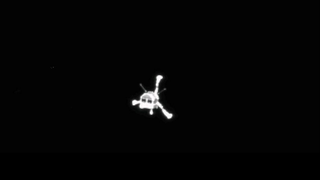 Earlier today, ESA mission controllers confirmed that the Philae probe made touchdown on the comet. But because its harpoons didn't fire, Philae may not be entirely stable on the surface. Mission controllers are in communication with the probe and they're receiving a steady stream of data. Already, Philae has confirmed that its harpoons were fired and rewound and that it's sitting on the surface. It's flywheel is going down as planned. Controllers have confirmed that the probe made a soft, gentle landing — but that the anchors did not shoot as planned. They cannot say with 100% certainty that Philae has in fact landed on the comet and/or that the probe is safe and secure on the surface. There's still the possibility that the mission controllers will have to reshoot the harpoons to gain a firm foothold on the surface. This page will continue to be updated as information arrives.